Eight of Cups: “Seeker of the Seas, dive down, dive deep. Plumb the sapphire waters so dark that they pulse with the nacreous gleam of black pearls. Slice through the waters, O seeker of truth; slide with lithe body through the currents and undertows; turn away from the sunlight of the world up above that blinds with its too sharp brilliance. Like the delicate luminescence of the deep sea life, there are some things that can only be seen when the eyes are enlarged int he dim, nether-lit otherworld. Dive down, seeker of the seas! 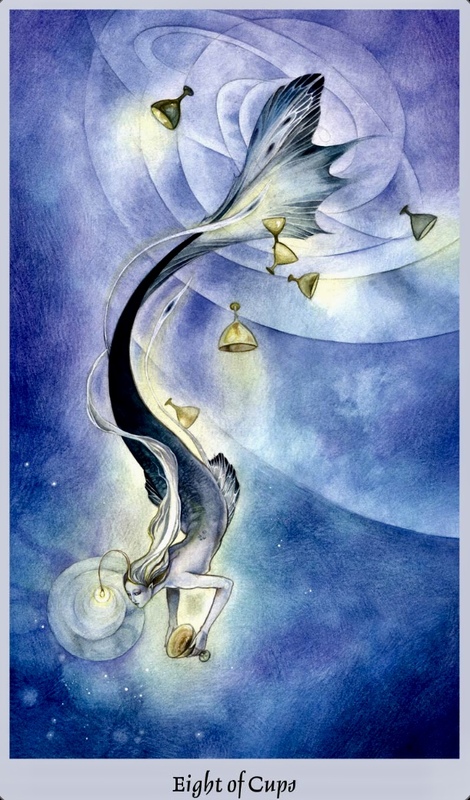 Eight of Cups beckons you to follow and delve within for personal discovery and answers. Turn away and disengage from the material world for the spiritual. Leave the sharp lines and edges, the harsh sounds that pierce the dry air with a clarion call. The sea’s embrace is much softer and more sensual, and connected by the ripples and the flows. The water softens the assaults on the senses, so that everything becomes fluid and smooth. Notice how the cups in this depiction are not needing to be held upright, full. Instead they appear like torches, illuminating the darkness. Notice that the sea here feels like another realm of reality, another dimension; the shapes of the moon, Jupiter and Saturn looming in the distance. Notice her tail is one of a mermaid, but also reminiscent of a butterfly wing, a sign of imminent transformation. And what does water stand for? The depth of our emotions of course. If we can surrender to the quest; dive down deep; find some solitude and give ourselves a chance to contemplate, learn and assimilate the energies? Then we will illuminate our new path, with grace and ease. The shadows will be revealed and the light shined upon them. Resolution can be achieved. We are being told that we must dive into the murky depths, but we are never alone. See the cups as your spirit guides, lighting your way. It is when we refuse to dive deep that we hold ourselves back. We deny the lessons, we get stuck in the same patterns. Now we have a chance to see why, to see what has been going on. To take responsibility and to set the intention for something new. The butterfly wing lets us know that when this part of our journey is undertaken and the work is done, we can finally rise above it, transformed. Saturn is considered the planet of karma, of boundaries, awareness and perception. Jupiter is the planet of expansion and knowledge, of spiritual purpose and blessings. The moon represents the Divine Feminine aspect, illumination, enlightenment, magic and mystery. Be alone today for at least a while. Meditate. Contemplate. Build and altar. Listen to your body. Release your mind. Invite your Higher Self in to guide you. Surrender to the silence. Do not fight the change. Trust.